My first foray into all things Glossier. I know. It’s one of those achingly cool NYC brands that sets hearts aflutter and gives major klout to your instagram. The whole aesthetic behind the brand with its little quirks really just speaks to me – it’s all about your skincare and just enhancing everything out in a minimalistic way. The brand is hyped, yes, but I am really pleased to finally have some of the products. I’ve been reading into the gloss for years and it’s one of my favourite sites as well, so even more exciting. 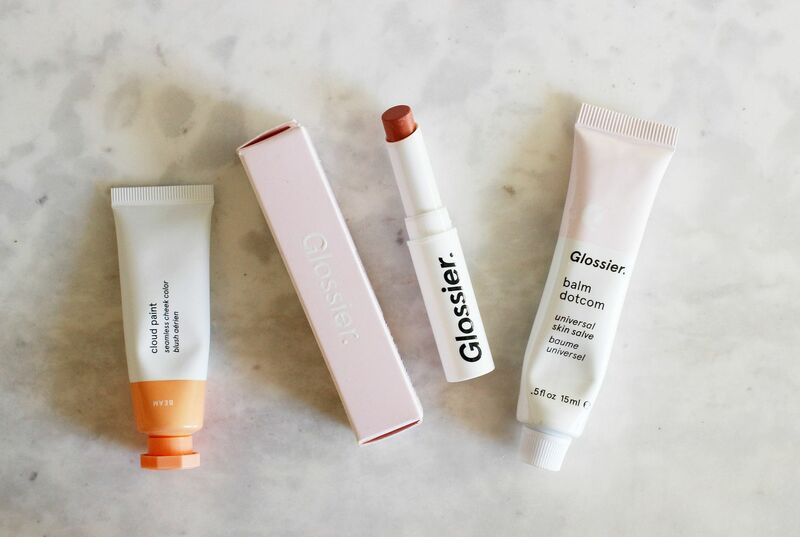 My colleague brought these back for me from New York, but my friend Jasmine has a post all about how you can ship Glossier to the UK – it’s also launching in the UK later this year! So exciting. So, the three things I asked for – I didn’t want to be too cheeky to my colleague so asked for a respectable three things – a blush, a lipstick and a balm. The Cloud Paint in Beam is a cream blush revelation – one dab blended in with finger tips leaves skin with a plumped-up glow all day (plus the name is adorable). Puff is next on my list. The Generation G lipstick in Cake is my least favourite of the three – it’s really really sheer and whilst it is good for a completely believable no makeup look, it’s just sheerer than I expected. The packaging also feels really cheap to me… I’m still playing around with it, we’ll see. Ending on a high with the Balm Dotcom, which really is a fantastic lip balm – not too sticky but enough to add some serious moisture to lips. I’m definitely going to go back for the flavoured ones when I can! Have you tried any Glossier yet?